Whuddup? It’s Wednesday, when we talk about What We’re Reading with the freshly-delivered-of-her-bebbeh Jessica over at Housewifespice! Amy M. Bennett is back with another tale of murder, mystery, and man-which-guy-do-I-want-Corrie-to-end-up-with!? What’s No Lifeguard on Duty about? 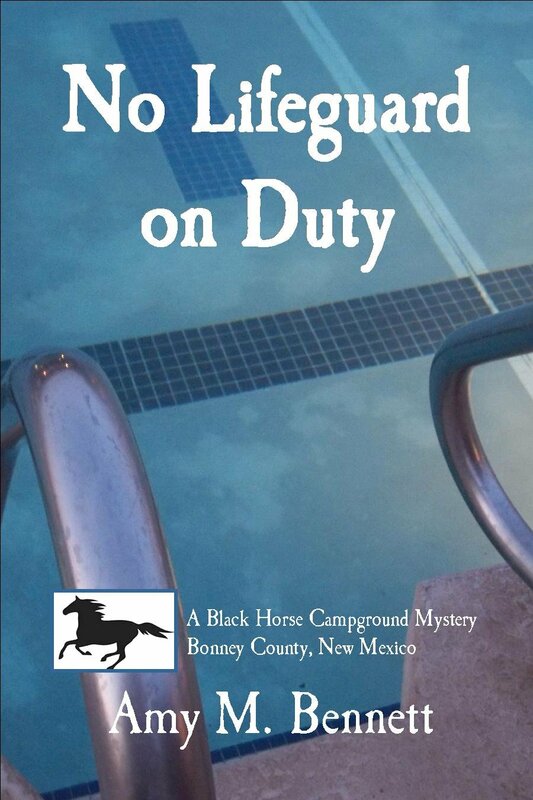 Summer is coming and at the Black Horse Campground in Bonney County, New Mexico that means warm sunny days, a cool refreshing pool, and… murder? Corrie Black and her friends are ready to welcome the summer camping season with a party to celebrate opening the swimming pool… but murder becomes an unwelcome guest! The shock of discovering Krista Otero’s body in the pool the morning after the party is bad enough… what’s worse is that Krista’s death wasn’t an accident. And what’s more confusing is that Krista’s closest friends all have something to hide. Despite opposition from Bonney County’s finest, Corrie is determined to find out who used her swimming pool as a murder weapon and who is using her home as a base for illegal activities. But someone wants to keep Corrie out of their business… even if it means killing again! I loved this second book in the series! If you’re looking for a clean mystery that will keep you guessing, keep you laughing, and keep you cheering, then No Lifeguard on Duty will be sure to satisfy. After only two books, it’s like the people of the Black Horse Campground are already my family. Corrie, Rick and JD have the most tantalizing yet non-trashy ongoing flirting triangle I’ve ever read. The mystery itself is well-turned and hits all the right notes throughout. Bring on Book #3! This is the kind of book that a faithful Catholic can read without being scandalized and a person of no faith at all can enjoy without being irritated, preached at, or otherwise bored to tears. Amy M. Bennett really knows how to turn out the UST, which is my favorite kind of ST to read. I’ll also admit here that I was 100% sure I knew “whodunit” until about twenty pages from the end, and it turned out I was 100% wrong, so expect to be surprised by the twists and turns. The characters all have their motives but nobody is demonized (well, except Corrie’s “date,” but he kind of deserves it…). No Lifeguard does well as a stand-alone, but if you haven’t already read the first book in the series, I heartily encourage you to do so. You can also read my interview with Amy here.